I have been using coconut oil (in addition to olive and canola) for several years. I especially enjoy it in Thai cuisine and for sauteing some vegetables. In the winter, I make my son a chai coconut latte (chai spice, coconut oil, milk, vanilla and honey all frappe-ed together…one of his favs). My daughter likes to use it when she makes eggs and her protein pancakes (eggs and bananas). Coconut Oil can be a bit trickier to use than olive and canola as it is very temperature sensitive. In my home, it's liquid in the summer and solid in the winter. I've only ever seen it sold in the solid form in tubs. It can be messy in the summer trying to scoop out a liquid from the tub. In the winter, trying to dig to the bottom of the tub can also be challenging. I melt a good portion of it by scooping it out and putting it on the stove in a pan or in the microwave in a glass bowl, and then use a funnel to fill a glass bottle with it. This particular bottle is from Frank's Hot Sauce. I always have a couple of similar bottles on hand for a variety of reasons. In the winter, when it's solid, I just quickly warm the bottle (as opposed to the whole tub) in a pot of warm water or the microwave (lid removed). It pours just like your other oils this way. 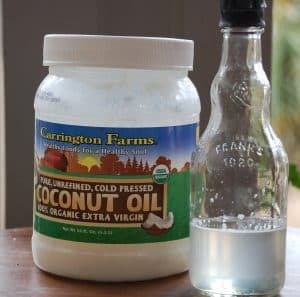 This really makes using coconut oil so much easier!